What is the Class of an Office Building? If you’re new to the office rental market, you may find yourself confused by the reference to office building classifications. What are office building classifications, and what do they mean? There are vast numbers of office spaces available to lease in New York City. The classification system is used by real estate agents to differentiate between the properties on offer. Understanding this system can be your secret weapon: a shorthand for knowing what a certain building may have to offer, and whether it is likely to meet your needs. It can also be a way to estimate ahead of time what kind of price you can expect to pay for space in a specific building based on its classification. It’s important to note that the classification system is not a national standard. There is no governing body that lays out the criteria that a building must meet in order to be considered Class A vs. Class B. Each area of the United States will have different ways of classifying buildings. What makes a building Class A in a given city is relative to what else is offered in that market. This means that a Class A building in Tulsa is not necessarily comparable to a Class A building in New York City, and vice versa. It’s all about knowing the market you’re in. In this blog, we’ll strongly reference the market in New York City to provide you with specific examples of the different office space classifications. Class A office space tends to be the best on the market. They tend to be newly constructed or freshly renovated buildings. Class A office space is fitted with top-of-range fixtures, amenities, and state-of-the-art systems. You can expect to see architectural flourishes that set these Class A buildings apart from the crowd, and to enter the building through an impressive lobby space. They are generally managed by well-established property management firms, and are frequently located in premium locations. New York City and Manhattan in particular is home to some of the finest office spaces in the entire world. Class A buildings in New York City will be among some of the best office spaces available in the world. Walk through New York’s bustling financial district, and you’ll be surrounded by Class A buildings. These are the gleaming skyscrapers that house many of the city’s best-known finance, law, and media companies. Because of the prime locations and above-average appearance, rental prices in Class A buildings come at a premium. In New York City, average rent for Class A office space is around the $79 per square foot mark. The next rung down on the market is Class B office space. This type of office space meets average standards. They may be a little bit older and lack some of the more impressive features of Class A buildings, such as an imposing lobby. In fact, some Class B buildings may have started their lives as Class A buildings, but age has led them to being downgraded. However, they will generally still be well-maintained and fully-functional, with the standard range of facilities and amenities. Especially in New York City’s competitive office market, you can still expect a high standard from the city’s Class B properties. Still, “average” is the keyword when it comes to Class B office space. Location, property management, and systems — you can expect to receive the standard (or slightly above depending on your market) offering for your city in one of these buildings. In New York City, you’re more likely to run into Class B buildings in Midtown, or alongside streets and other peripheral locations. For that reason, you’ll likely end up paying average rent for this building based on your market. In New York City, Class B office space goes for roughly $72 per square foot. 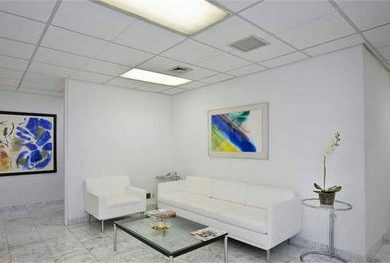 Class C office space exists to provide basic functional office space for competitive prices. Generally, they tend to be in less desirable locations, and are likely to be older buildings. They will lack the flourishes of Class A or B buildings, and may need significant repairs. Class C buildings may also lack some of the amenities you consider standard, such as elevator access or access during off-peak hours. These drawbacks translate into lower-than-average rental costs. These buildings are often the go-to choice for new businesses or smaller operations. Understanding the differences between office space classifications can help you target your search. If high visibility and impressing clients is important to your business, looking to rent in a Class A or Class B building will be important. If keeping overhead and costs low is a bigger concern, than Class C office space would be exactly what you’re looking for. If you’re looking for a solution that offers you access to high-end New York office space at a competitive price point, each of Bevmax’s office locations can offer you and your clients a premium experience. Contact us to learn more about the spaces we have on offer, book a tour, or get a quote today.